Ray Block (left), VP at Golden State Farm Credit with Lt. Craig Rodriguera of Salvation Army. 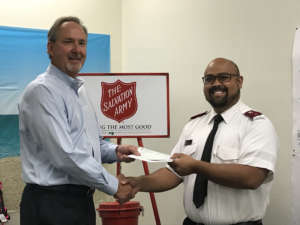 Chico, CA (8-24-18) – Golden State Farm Credit and CoBank, cooperative banks serving vital industries throughout rural America, have donated $10,000 to the Salvation Army to help further their efforts to support the residents, in Shasta and Trinity counties, affected by the Carr Fire. As one of the nation’s major emergency relief organizations, the Salvation Army recognizes the critical importance of being prepared for natural and manmade disasters. The Salvation Army activated immediate emergency response to help the Shasta County residents affected by the Carr fire. After the fire has been contained and the response teams go home, the Salvation Army will provide much needed long-term recovery assistance to those in need. They understand that it will take several years for the Shasta Community to recover from the devastation caused by the Carr fire.